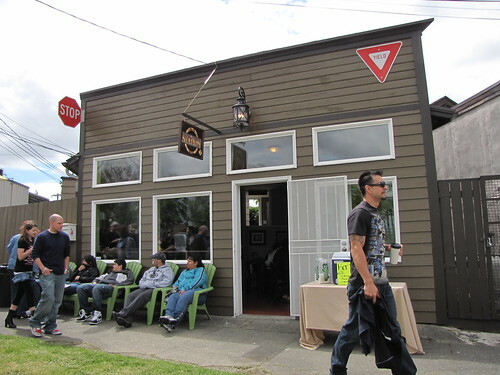 The operators of The Station coffee house, across from El Centro at 2533 16th Avenue South, have applied for a “Beer/Wine Restaurant” liquor license. According to the Liquor Control Board, this type of license would allow them to “sell beer and/or wine for on-premises consumption in conjunction with food sales, either on tap or in opened bottles or cans.” The City is seeking comments on whether to support the issuance of the license. If you have any comments on the matter, either positive or negative, send them to Bill Reddy, Department of Executive Administration/Revenue and Consumer Affairs/License Enforcement Unit, 700 Fifth Avenue, Suite 4250, P.O. Box 34214, Seattle, WA 98104-5020. The Station's grand opening day, earlier this year. Photo by Wendi. Cool. Can’t wait to have a beer!! Thank you so much Wendi! we are hoping to open later hours till about 11pm Thur,Fri and Saturdays for coffee, wine and desserts i would love to have the support from the neighborhood we also have a local art gallery every month with local artist this month’s artist name is Jason Waskey and his paintings are all from Beacon hill, come and support his art as well.